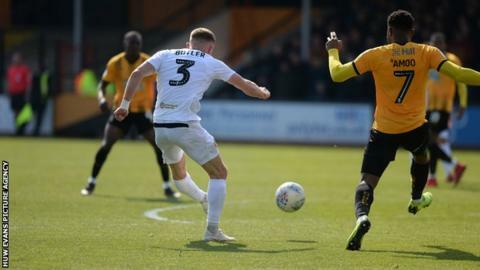 Newport County stayed in touch with the League Two play-off hopefuls with a vital 3-0 win at the Abbey Stadium. Padraig Amond set Newport on their way by applying the finishing touch to bury Robbie Willmott's inviting cross. Jamille Matt doubled their advantage by turning home Dan Butler's shot. Sub Harry McKirdy added a third late on after another Willimott cross as Newport produced one of their best away performances to secure a third successive clean sheet in League Two. The Exiles remain in play-off contention, five points off the pace but with a game in hand. "We could have won by five or six, but we defended excellently and the result showed what we are about. "I am over the moon, the boys were fantastic, it was a near enough perfect away performance. "We are still in with a chance of the play-offs in April and I am very proud. We will keep going."